I'm summoning that pesky dream. You're gone, and both of us are safer. Lena is the only daughter of the rich Russian oligarch, Anton Malakhov but despite her privileged life, she is unlike any rich kid. She is shy, quiet and someone who just wants to find her place in the world. A lover of the Russian poetess, Marina Tsvetaeva, Lena is happy while reading and translating the poems of this great poet and feels that these poems connect with her life. Wanting to become independent and get away from the shadow of her over protective father, Lena comes to the beautiful city of Paris and this is where she meets Rob, a handsome Frenchman who waits tables at the La Boheme Bistro, just under her apartment and the boy who takes her breath away every time he looks her way! But Rob has his own agenda for befriending her. He is poor, struggling to pay his college fees with no support from his family that feels he should return home and take over the family farming business! So when a man offers him huge sums of money in return for spying on Lena, he grudgingly agrees. What starts as a sweet innocent attraction between these two very different people is tested in the fire of difficulties, misunderstandings and time. Are Lena and Rob's feelings for each other true? The cover is cute. The blurb is catchy and piques the reader's interest. This is the first book by Alix Nichols that I have read and I was pleasantly surprised by the story. When I started the book, I thought that I already had it figured out but I was proved wrong at every turn. Whenever I thought I knew what was going to happen next, the author shocked me with a completely unexpected twist to the story. The characterization is expertly done and I felt connected to the people in the story. All the people in the book feel real and I felt that I already knew them. There is Rob's grandfather who is a dreamer, the realistic father and mother of Rob, the driven Rob himself who has much to prove to his family, the shy but confused Lena who is still trying to find her calling in life, her over protective father who still is not able to understand why she wants to run away from all the comfort and riches he can provide, the mother Lena has not seen in twelve years and other characters like Jeanne, Amanda, Mat etc. They all are people with a story to tell and Alix handles each character with an expertise that is noteworthy. She is able to bring out their emotions, their frustrations and gives the readers a new insight into human nature. I was caught and then sucked in the story where it felt like everything was happening before my own eyes. Even though I have never been to Paris but still I could visualize myself sitting at the corner table at the bistro drinking coffee and watching the hustle-bustle of customers around. I could see myself before the Eiffel Tower getting a picture clicked and then just as effortlessly I was in Russia and could feel the bitter cold so in contrast with the pleasant weather in Paris and see a beauty so different from the cozy chaos of Paris. Although, I appreciate the skill, planning and execution of the story but still there are some points that I felt needed more addressing. First is the whole espionage angle against Lena and her father. I would have loved to see this angle elaborated and addressed properly. I was definitely intrigued by this angle. Second is the whole proving-it-to-my-family angle for Rob. Nothing is told as to what happened to all the differences between him and his family. Were they resolved? Or did they still stand between them? I loved the whole experience of watching Lena and Rob grow over a span of several years and felt completely invested in their struggles in overcoming all the misunderstandings, difficulties, fears and uncertainties to finally get a happily-ever-after. Although Rob and Lena are the protagonists but still there are other happily-ever-afters also in this story that touch our heart and make us feel all giddy with love! Alix admirably handles a number of different people and fluidly connects them with each other to give us a touching and totally real like story. 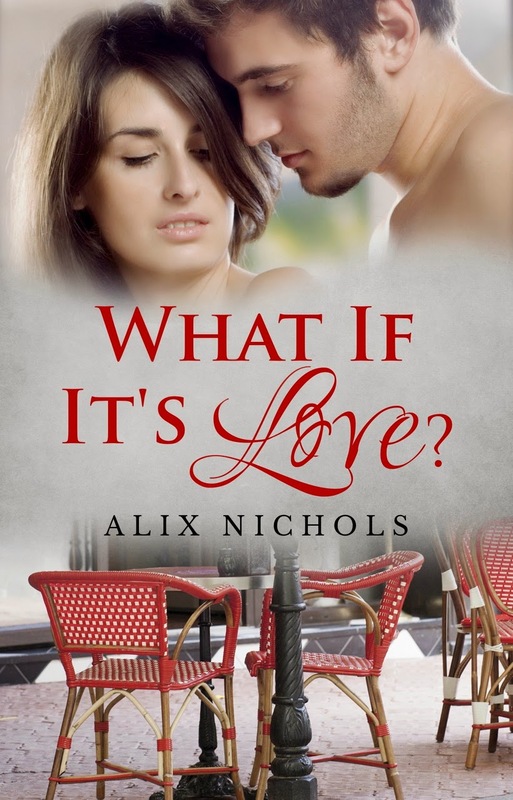 A very engaging love story from a promising new author, What If It's Love? is a story of second chances in love and will appeal to everyone who has been or is in love! 4.5 out of 5 to What If It's Love? from me and a strong recommendation that you go read and enjoy this very entertaining book. Alix Nichols is an author to look out for and I hope to read more from her in the future. -$15 Amazon GC, 3 Ebooks, 3 Paperbacks.